In March 2018, Triumph brought in the new Tiger 800 to India. During the time, the British bike maker only brought in the XR, XRX and the XCX variants of the adventure tourer. Now, the company has added another variant to the model line-up – the XCA. Priced at Rs 15.17 lakh, this new trim will sit above the other three variants previously introduced. As on date, the XR demands Rs 11.99 lakh, while the XRX and XCX carry a sticker price of Rs 13.39 lakh and 14.03 lakh respectively. All prices ex-showroom. Being the top-of-the-line variant, the XCA gets better equipment than the other trims. While the XCX gets five riding modes – Rain, Road, Off-Road, Spot and Off-road Pro, the XCA adds a programmable rider mode too. Additionally, the XCA also comes with WP suspension at the front and rear, cruise control, Aluminium sump guard, radiator guard, centre stand and heated seats. 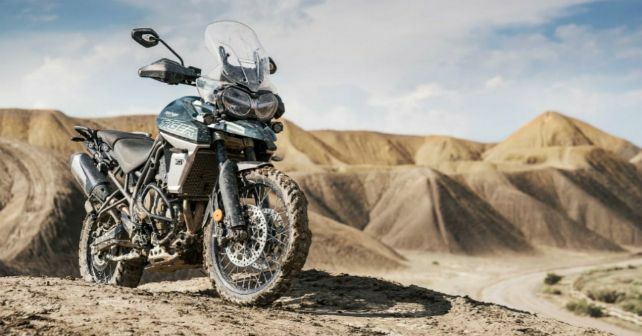 At the heart, the 2019 Tiger 800 XCA remains the same as the rest of the variants. It develops 94bhp and 79Nm from an 800cc three-cylinder motor. This engine comes paired with a six-speed transmission. Just like the XCX, the XCA too comes with 21-inch spoke wheels up front and a 17-inch one at the back. Triumph has already commenced bookings of the XCA for a minimum amount of Rs 1 lakh. Deliveries are expected to commence in a few weeks’ time.